Another disc to prove, if proof were needed, that the standard of brass playing around the world, from band to symphonic and all points between has never been higher. This is the debut disc by Filmharmonic Brass - a seven-piece New York based group. The ensemble is an evolution from the New York Filmharmonic Brass Quintet, which was drawn, in turn, from a session orchestra of the same name, which recorded music for film, TV and commercials into the early part of this century. By expanding from a standard brass quintet to a septet, the additional trumpet/flügelhorn and trombone fills the texture substantially - greatly to the benefit of the music. The disc - perhaps somewhat short at under 55 minutes - is devoted wholly to the film music of John Williams. Williams has long been admitted to the pantheon of film composer greats and this disc serves to remind the listener of just how many extraordinarily memorable scores he has written. All the arrangements here are 'in-house' by trumpeter Charles Porter with the exception of the excerpt from Born on the 4th of July which is brilliantly arranged by Jihwan Kim. Any disc such as this will always provoke debate amongst film music admirers about the music chosen and the selections omitted. So rich is Williams's catalogue that favourites have to be overlooked, but most of the most famous Williams film scores - with the exception of Superman and Close Encounters perhaps - are included. As mentioned, the playing from start to finish is of sovereign technical brilliance and the interpretative music-making is excellent, too. That said, I do feel that some of the selections are more successful than others. 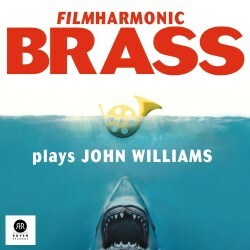 Williams in heroic and valedictory mood is a shoe-in for brass so Raider’s March, Theme from Jurassic Park and the famous Star Wars excerpts: Main Title, Imperial March, and Throne Room are superb, even if they do not erase the sonic splendour of the original full orchestral versions. The quick-silver flitting scherzi of the Flying Theme from E.T. and Hedwig's Theme from Harry Potter are less convincing, simply because no matter how virtuosic the playing - which this certainly is - the brass instruments cannot create the light scurrying agility of the original. Likewise the theme to Schindler's List needs to be a violin - the awkwardly angular but memorable theme which lies rather well under a violinist's fingers sounds less flowing here. But then Jaws is a resounding success. One thought on the arrangements - the inclusion of a percussionist (or two) could have rounded out the music even more - Williams's music is so full of rolling pedal notes and cymbal crowned climaxes that they are sorely missed. In some ways the 'rarities' of Born on the 4th of July and Horseplay from Stepmom are some of the most enjoyable, possibly because the originals are not so deeply embedded into the listener's memory. The engineering is very good - quite close so that occasional gasps for breath are caught, but with enough hall resonance to give the instruments a gorgeous bloom. The liner includes a session photograph of each player and a very brief - too brief really - note. The track listings are a little confusing in that they do not always give the full or correct title of the film. I do like the rather witty CD cover - an unsuspecting horn floating in the sea with Jaws beneath. All in all a very enjoyable addition to my collection of brass and film music. Not a disc to replace OST's or favourite orchestral collections, but certainly an excellent appendix to such discs.